Does anyone know how to change the angle of the steering column on an A or AA? 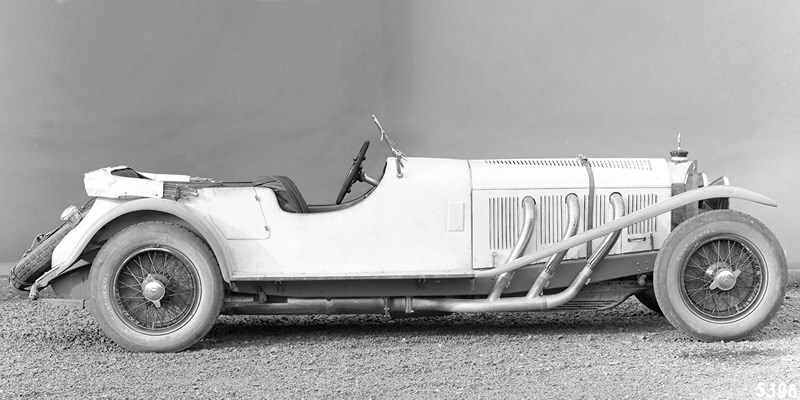 Because, I would like to make a "Brooklands" or "Chitty" style racer, out of a Model AA. So, is there any easy way to do this? Steering column drops are available from some vendors. They go between the tank and the steering column. You will have to slightly slot the steering gear mounting holes in the frame to allow it to rotate slightly. I welded the back slack side of the slot so the bolts are still a tight fit. Also you will have to address the area where the column goes thru the firewall. I don't remember what I did in this area so it couldn't have been much of a challenge. The drop would be small. The mount that goes on the gas tank support will only drop a small amount. The more you drop the column you will need to change the length of the drag link to keep the same center to extreme left or right in the steering geometry. The drop sold by the venders should not need a lot of correcting in that regards but if you want the wheel lower it will take some engineering. I know it seems far fetched, but, everybody needs a dream... Right? I suggest you use AA Wire wheels and the later rear end in as high a speed ratio as you can find, and an overdrive and an auxiliary transmission. I think modifying the steering column should not be the highest item on your list. Is there any difference between Model AA Wheels and Model A wheels? I moved the cowl back 12" on my model A Speedster. Moved the steering column back as far as I could on the frame. Installed a short pitman arm. Then made a longer rod. All works great. The Model AA wire wheels are larger. The tire is held on with a snap ring on the AA's and the mounting bolts are larger with different spacing. AA Wire wheels are styled like the A wheels but are designed for a 6.00-20 or 6.50-20 tire. They do have a snap ring as Mark stated. Ted, thanks for the link. Mark Freimiller likely has every part you need. You might call him, Model T Haven, Iola, Kansas. Would it be possiable to have someone with a large lathe cut and make the stock rims wider?? A set of later wires 33 34 would fit and look?? Bud. Yes, wire wheels have been cut down in the past. Model A wheels were cut down and fitted with 16 inch rims. His speedster looked massive and made from an AA chassis it would be. 33-34 Wire wheels are car wheels and would no directly fit an AA truck hub. The AA chassis could be refitted with car axles and car suspension. An AA speedster on AA springs would be like having no springs at all. Been there Ted.Had a 29 AA with the single disc and several AA Doodle Bugs.Seems hard to make a [sports car] out of a Model AA? I think a factor might be the cost of AA wires?? Bud. Today we bought a Model AA and we picked the her up and brought her home. It is a dually, the engine is locked up, tires are shot as well as the radiator, and it has no cab. Thanks for your support guys! I will post pictures tomorrow evening. Sorry about not having pictures up yesterday! Weather has not been on my side these last few days. We have had freezing rain the last few days, and the camera doesn't like the cloudy sky and dampness. Hopefully the weather will let up, and I will be able to post some pictures before the week is over. How big (Diameter) are those Model AA Wheels? Could you upload some pictures? And how many do you have? Looking for possibly a set of six. But, I'm really looking for some 30 inch wire wheels. I know Ford didn't make any, and I haven't found any on the internet either. Looking at the picture above, and I'm wondering if could you take those Model AA Wire wheels and put some taller tires on them? A 21 inch (wood or wire) wheel with tire installed are about 30 inches tall. If it's a 28 or 29 AA the front axle and king pins are the same as car so you should be able to put car spindles, backing plates and hubs on the front. If you were going to use a car rear axle, that would take some work as you would need to make a longer drive shaft and tube plus find a way to mount the radius rods and axle spring hangers. The rear end is worm drive (=slow unless it has a high speed rear end), there were a few ring and pinion rear ends in 29. If it's 30-31 everything about the chassis except the motor is truck only and are still not that fast as they were built to carry loads not speed. One other point the correct hub caps for the AA wire wheels might cost as much as the wheels or more in good shape. They are not reproduced. If it has dualls i think 30 or 31 but whatever i do not think you want to use a model AA rear end or the 4 speed trans. Will the AA wire wheels work on 30 or 31 hubs?? Was the 3 speed available on the AA in 30 or 31? Bud. aa wire wheels are very expensive, as stated hub caps are very expensive, 600x20 tires are very expensive, the hubs are used only on wire wheels, its all very heavy , very slow, and its all a very bad idea. sorry to burst your bubble, but you need to rethink this a bit. A 6.50 x 20 is approximately 33 inches OD. You build a speedster however you want to do it. You don't have to get your parts from a dealer. If you keep your eyes open you will find parts you need on a rusty hulk out in a field somewhere. Ok, so much new information to take in!!! This is a LONG term project, but the point is to have fun, right? Ok, Now I have a question. My motor is rusted stuck, completely. I have removed the head, poured half a bottle of Marvel Mystery oil in all of the cylinders, along with spraying them previously with some Nut-Buster. I haven't taken the oil pan off. And I'm wondering if there's anything else I can do. The transmission is free, I think, and we might try to tow it in neutral. Then, while moving, put it into gear (Hopefully this won't destroy the transmission in the process ), and this might break the the engine free. In 1974 I filled the cylinders on my Farmall M with old fashioned Kerosene. After a month or so the kerosene seeped thru. Then I used a small sledge and 2x4 on each piston until I broke it free. I then used an 18 inch pipe wrench to turn it over. If you just put your stuck engine in gear while pulling the truck, something will likely break. My ideal Christmas present would be to get the engine unstuck by then. We MIGHT get it free by then, otherwise I'm hoping for the new year!